Aaron Conquered the London Marathon for TheatreMAD! 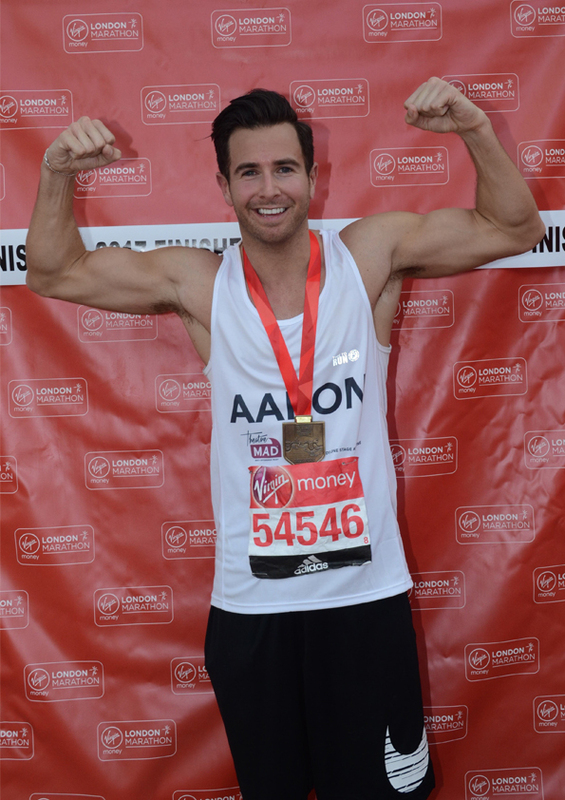 THE RUNNING TOTAL RAISED BY AARON FOR THE MAKE A DIFFERENCE TRUST ON VIRGIN MONEY GIVING IS A FANTASTIC £2,496.20 THANKS AARON RENFREE! Hello everyone and thank you for visiting my page. Yes you heard right I’m doing this year’s London Marathon and I would be ever so grateful if you could sponsor me and donate for such a great cause. The Make A Difference Trust is a charity that means a lot to me especially being affiliated with performers, I’ve been raising money for them for the past 7 years, choreographing and taking part in West End Bares & West End Eurovision and this year I’m taking my personal contribution to the next level. I’m also 30 this year and wanted to do something special and what better way than to take part in such an iconic event and run on behalf of my closest charity. The MAD Trust is a UK based charity with over 25 years of fundraising by the theatre industry. The raised funds go to HIV and AIDS projects that build awareness and provide care, support and education in the UK and Sub-Saharan Africa. I’m so up for this challenge and ready to raise as much as i can to help this worthwhile cause. Aaron was once a member of the pop group S Club 8 (formerly known as S Club Juniors), they achieved 6 top ten hit singles and 2 top ten albums, the first of which went platinum. They were winners of the Disney Channel Awards for Best Newcomers and nominated for Record of the Year 2002 for ‘One Step Closer’. They played at the Queens Golden Jubilee, Prom in the Park, The Royal Albert Hall and Children in Need as well as regular performances on TV shows. In 2003 they embarked on their own sell-out UK tour S Club United performing in front of a total of over 200,000 people. The band then went on to have their own hit TV series on BBC called “I Dream” that was filmed in Barcelona. After the bands success, Aaron went back to college and trained at Laine Theatre Arts where he graduated with a National Diploma in Musical Theatre. His dance career then furthered as he started dancing commercially working with the likes of Taylor Swift, Little Mix, Kylie Minogue, Sean Paul, Take That, Fleur East, Olly Murs, JLS, Alexandra Burke, Kimberly Wyatt & Adam Garcia. Plus TV shows such as X Factor, Britain’s Got Talent, The Voice, The Brits and Royal Variety. Aaron is also very passionate about choreography and has worked with The Saturdays and on X Factor Tours where he was also assistant show director. Aaron has choreographed the Professionals On Ice tour the last couple of years which lead him onto woking with Torvil & Dean in Panto. Most recently Aaron became the head of MF DANCE – one of the UK’s largest dance organisations that has thousands of students ranging in age from 2 to 60. Aaron is keen to spread the word and introduce MF DANCE to more aspiring dancers across the UK as well as teaching at the schools and choreographing the curriculum. Whether students wish to pursue a professional career, or learn a new hobby, MF DANCE helps them discover skills they never dreamed possible, there are also exams and assessments for those who wish to take them. The dance classes are professionally structured to build confidence, fitness and discipline in a fun-filled environment with highly trained instructors.